George Johnstone claimed Satan was behind the attack in broad daylight in Viewpark. 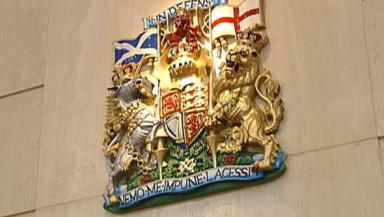 A man who firebombed a Lanarkshire house in broad daylight has claimed the Devil made him do it. The High Court in Glasgow heard that 58-year-old George Johnstone armed himself with a hammer and jars filled with petrol before targeting a house in Burnhead Street, Viewpark, Uddingston, on August 23 last year. Johnstone first off all set fire to a car parked in the driveway and then smashed the double glazed windows with the hammer and began lobbing the petrol bombs into the living room. Goerge Martin, 28, and his girlfriend Jillian McLean, who were inside the house, heard Johnstone shouting: "I'm going to kill you." Prosecutor Paul Kearney said: "The incident took place at 12.30pm. Mr Martin noticed the accused, who was the son of friends of Mr Martin's parents, standing outside the house. "After a minute he wondered why the accused hadn't knocked and looked out to see his girlfriend's car ablaze. The accused had a hammer in his hand. He smashed through the double glazing and threw a petrol bomb, followed by three or four others." The court was told that Mr Martin managed to throw the first petrol bomb into the back garden, but suffered minor burns to his hands. When he returned there were three or four areas of the living room on fire. The accused then threw petrol over Mr Martin and tried to light it, but his lighter wouldn't work. In court Johnstone admitted assaulting Mr Martin and Ms McLean to the danger of their lives. He was originally charged with attempted murder, but the Crown accepted his plea to the reduced charge. Johnstone also pleaded guilty to wilfully setting fire to the house at 120 Burnhead Street and the car. The court was told that Mr Martin and Ms McLean were extremely upset by the incident. Two doctors said that Johnstone was fit to plead and had not been insane at the time. Judge Lord Turnbull placed Johnstone on an interim compulsion order and ordered him to be detained at the Rowanbank Clinic in Glasgow. He will be sentenced in April.